If you’re a mom or a dad, you’ve known the otherworldly time of pregnancy, childbirth, and just beyond. Whether a new parent or a veteran, you understand that the postpartum season is incomparable. It brings the gift of new life, the fun of seeing your family grow, the marvel of our ability to cradle and sustain another human being. But it’s not the paradise portrayed by the Western World. Parenthood ushers in upheaval. Daily routines are obliterated. We ask questions that don’t have satisfying answers—or we find ourselves on the receiving end of unhelpful, unsolicited advice. Sleep is sporadic, and scarce. The monster called guilt scares us in ways it never did before. Our identity morphs overnight, and some days we wonder just whose life we’re living. What was familiar seems a lifetime ago, but it was just last week. This is true even when childbirth goes well, and there’s no ensuing illness for mom, dad, or baby. From the beginning, parenthood is paradox. It’s marked by the miraculous, and great love, even as it brings challenges and frustration. When we factor in postpartum illness of the body, mind, or both, it can be debilitating. Yet our Western way of life makes little to no room for setbacks. When we face a perinatal mood and anxiety disorder (PMAD), we’re stunned. Our expectations of utopia are swallowed by a grinding inferno. We’re trapped between the dueling extremes of what we had pictured, and what is. Such great expectations make sense, when you consider our cultural landscape. From the time we’re old enough to understand, our culture tells us how new parenthood should look: It’s life in perfect motion, with moms, dads, and babies bouncing into a blissfully easy existence together. These images pervade TV commercials, magazines, and social media. They saturate our psyches. The Western World is also very good at ignoring mental illness. So it’s not surprising when a postpartum mood disorder leaves us shaken and stranded in a stormy land of unknowns. When I developed postpartum depression after the birth of my first child, I was one of those shaken and stranded. I wish I’d known more about PPD and the array of perinatal mood disorders. They’re not uncommon. Postpartum depression strikes between 12 and 25 percent of new mothers. In some high-risk groups, rates are as steep as 40 percent, or more (Kendall-Tackett, 2016). During pregnancy, between 14 and 23 percent of women will battle symptoms of depression (American College of Obstetricians and Gynecologists, 2009). I wasn’t aware of these statistics—until I was one of them. We can do better by those who suffer from PMADs. To prevent unnecessary anguish and even death, we must fight back. That means learning more about mental illness in general, especially during the childbearing years. It also means we need a deeper knowledge of what helps people heal. Perinatal mood and anxiety disorders are depression and anxiety, and a host of symptoms. But they’re more than that. Each person has a unique experience of them. They can be triggered by trauma, such as a difficult experience in childbirth, or a past abuse. PMADs aren’t a replica of classic depression. They demand different, specialized care. And they typically introduce a season of grief and loss. When a new mother gets postpartum depression, she might grieve on several levels. She mourns the loss of her dreams, about how things were supposed to be. She grieves over her inability to enjoy the first weeks of her baby’s life. She misses her old, familiar self, and more. Therapy and medicine are the standard lines of treatment. They’re effective at returning mothers and fathers to wellness. But there’s a third, often-overlooked antidote that’s critical, especially when it comes to fighting stigma: story. Sharing our stories of illness, pain, and suffering are the first steps toward healing. By sharing, we realize we’re not alone, and we’re encouraged. By sharing, we learn how other people recovered, and that asking for help is a sign of strength. By sharing, we see that the dark days don’t last forever, and this brings us hope. The power of story was a great source of hope for me during PPD—sharing my experience, and hearing from others. The more I learned, the more I wanted to write about PMADs. Story and hope would form the double helix of whatever I wrote. As I gathered information, I knew I had more than just an article. 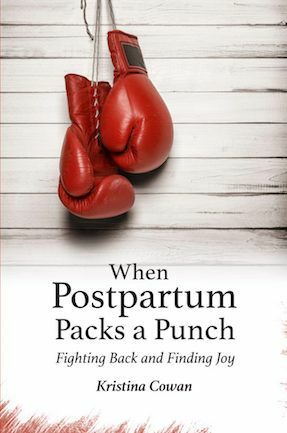 So I wrote my first book, When Postpartum Packs a Punch: Fighting Back and Finding Joy. It’s available at Amazon and Barnes & Noble. My goal is to give readers gripping stories of hope, and show them that they can heal and rebound. My own story of PPD is the cornerstone. But the book’s core is comprised of stories from other parents, mothers and fathers alike, and their journeys through perinatal mental illness. It might seem that the book would only interest expecting and new parents, and health care workers. But I believe the audience is broader. It holds appeal for anyone who’s experienced grief and joy, love and loss, trauma and survival. Good and bad are the odd twins defining our days. They rush at us, often together. The longer we live, the more we see that good and bad will always co-exist in this life. That co-existence leaves us confused and dismayed, and it’s easy to get stuck there. But we’re not defined by the good or the bad things that befall us. Our response is far more powerful, and shifts the course of our lives. At the heart of holocaust survivor Viktor Frankl’s teaching is this sentiment: Between stimulus and response there is a space. In that space is our power to choose our response. In our response lies our growth and our freedom. Again, stories are invaluable. By sharing them, we can be angels for each another. We can build community, something we’re designed to do. Together, we lighten each other’s loads, and make sense of the paradox of parenthood. American College of Obstetricians and Gynecologists and the American Psychiatric Association. (2009). Depression during pregnancy: Treatment recommendations. Kendall-Tackett, K. A. (2016). Depression in new mothers: Causes, consequences and treatment alternatives (3rd ed.). Abingdon, UK and New York: Routledge.